Yesterday, the December corn contract closed 2 ½ cents higher settling at $3.48 ¼, and the July contract was 1 ¾ cent higher closing at $3.77 ¾. The November bean contract closed 7 ¼ cents higher yesterday, settling at $9.81, and the July contract closed 5 ¾ cents higher settling at $10.18. A short rally gave a boost to corn yesterday as funds continue to hold a large amount of shorts. The weekly ethanol production was supportive to the corn as production was up 1.6% over last week and up 3% from a year ago. 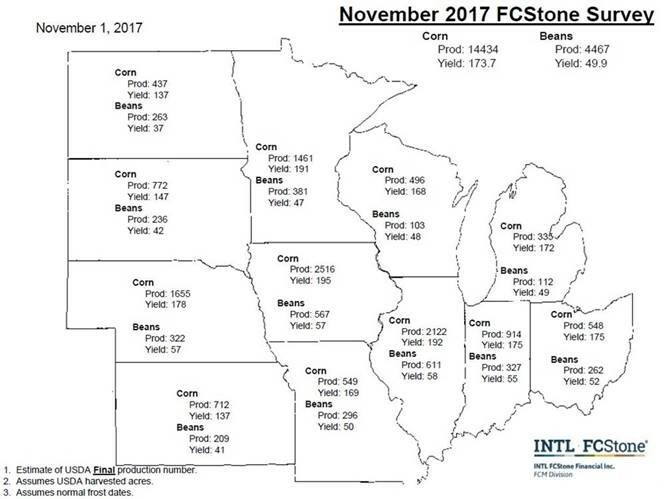 FC Stone released their estimated corn yields to 173.3 bu/acre, which is 1 bu/ac short of last years’ record. If FC Stone’s numbers are correct, it would add 75-100 million bushels to 17/18 carryout, not friendly to corn futures. Soybean crush numbers for September came out yesterday, and that fell into expectations, the soybean market has improved technically and is attracting funds into the market. FC Stone released bean estimates and left it unchanged at 49.9 bu/acre. See below for a breakdown of FC Stone’s survey results.